dedicated to crafting the highest quality of wine from the Oakville soil have emerged. We are the Oakville Winegrowers. The Oakville AVA is an officially demarcated two-mile-wide swath of Napa Valley that extends to 1,000 feet in elevation up the base of the Vaca Mountains to the east and 500 feet in elevation in the Mayacamas Mountains to the west. Within this small district you will find the greatest concentration of Napa Valley’s preeminent producers of Cabernet Sauvignon. The Oakville district was one of the first distinctive wine growing regions within Napa Valley to be officially recognized when it was granted AVA (American Viticultural Area) status in 1993. 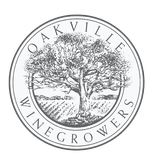 Today, the Oakville Winegrowers’ Association boasts more than 70 growers and wineries. The Oakville district of Napa Valley is so influential that a simple recitation of prominent Oakville winegrowers, from pioneers Robert Mondavi and Joseph Heitz to powerhouse brands Groth, Far Niente, and Opus One, through “cult Cabernet” producers Dalla Valle, Harlan Estate and Screaming Eagle, tells the condensed story of Oakville. The excellent publicity of Oakville’s wines can in part be attributed to the unique quality of its soils and enviable climate, but the story doesn’t end there. Oakville is distinguished by more than its terroir. Here you will find family-owned vineyards tended by meticulous growers, visionary wine marketers and some of the world’s foremost winemakers, all working together to craft unique, spectacular wines. Click here to learn more about Oakville's climate and soils.